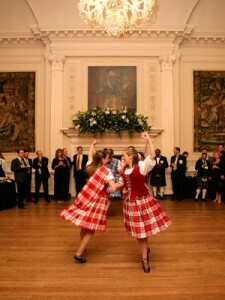 For a sophisticated, all-inclusive package of Scottish hospitality, entertainment and cuisine in elegant Georgian surroundings, our Scottish Gala Evening is unrivaled. Guests enjoy champagne in front of a roaring log fire, explore the grand interiors of the State Apartments within the main House at leisure and then dine under crystal chandeliers in the beautiful Adam Ballroom. “Beating the Retreat”, performed by Pipe Bands in full ceremonial dress, provides a spectacular finale to the evening, coupled with a fireworks display to further enhance the lasting impression that your event will make on your guests. 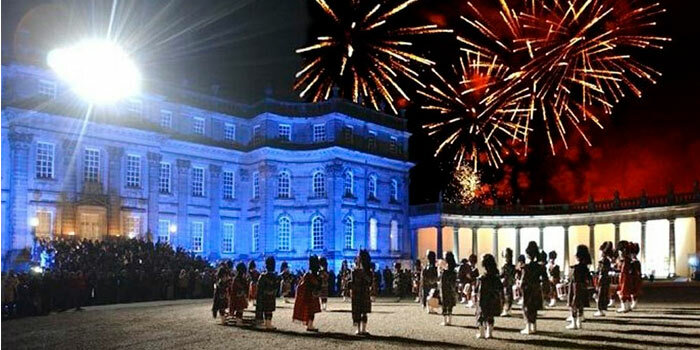 Entertainment, House Piper, Harpist, the Ceremonial Haggis Address, Ceilidh Band and Hopetoun House Dancers. Theming: Floral table centres and arrangements in the House and Ballroom; black floor length tablecloths, black linen chair covers, silver candle sticks, Menzies tartan napkins, base plates and Hopetoun House glassware and cutlery.